If there’s a place that is known as “The Capital of Silicon Valley”, that place would be San Jose. San Jose earned this nickname due the 7,000 tech companies that are located there. In addition, roughly 35% of the ventured capital funds that are invested into American companies are here. Pretty interesting transition that has happened over the years from being found as a farming community in 1777. Since San Jose and the surrounding area has been cultivating 1000’s of tech companies, this is the ideal place for QuickBooks to be holding QuickBooks Connect 2016. This is where 1000’s of entrepreneurs, small businesses, and developers will gather to learn, grow, connect, be inspired and to fuel their businesses to great levels – together. As a sponsor, of QuickBooks Connect, we are proud that there will be a speaker lineup of trailblazing, dynamic leaders, like Tony Hawk, Malcom Gladwell, and Eva Longoria who will be offering valuable, real-world advice that can help propel your business forward. The connections you can meet at this conference can help you jumpstart your company or take your business to the next level. We will be there as a sponsor and invite you to stop by and visit us at Booth B7 which located in the Uptown Exhibit Hall. We know managing your company involves managing your sales, customers, orders, inventory, vendors, invoices and so much more. 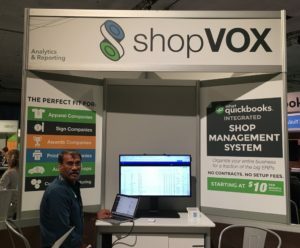 shopVOX will show you how you can manage all of these areas more effectively and efficiently with one comprehensive and easy to use tool so you can focus on other areas of your business like bringing in more sales.